19th October 2017 COUNCIL ANNOUNCED THEY HAD REMOVED THE SITE FROM THE NEW SOUTHWARK PLAN: Information about the campaign for the long term future of the building. Peckham Vision PMS merchandise is designed by Peckham Vision and printed by Make Good Print Co. in Peckham. There are tea towels, T-shirts all sizes, tote bags and greetings cards. All available for sale in Peckham Vision shop Holdrons Arcade 135A Rye Lane open Tuesdays 2-4pm and Saturdays 2-5pm. 3.15.3 What has happened since then? 3.15.4 What should happen next? 3.15.5 Why is the building important? Part of Peckham Vision's story, of the persistent and continuous hard organised community work behind the scenes of its successful campaigns, is told in this article in Time Out. Peckham Vision showed a small exhibition on the ramp between levels 5 and 6 about the history of Peckham Vision's community campaign about the long term future of the Peckham Multi Storey. photos of launch to be uploaded. See report in Southwark News. The rooftop view from the Peckham Multi Storey and the Bussey Building is now famous. But we have just heard that the developers of the Aylsham Centre / Morrison's site are planning a 27 storey tower block. This is just in front of the Peckham Multi Storey and the Bussey Building. So the view that we and others have promoted for 10 years, and has had a dramatic positive effect on Peckham's economy, is threatened. Previous information about the campaign to protect the rooftop views. Peckham Vision would like to thank everyone who supported our Peckham Multi Storey campaign for a review of the decision to demolish it: If you bought a T-shirt, tote bag, tea towel or card, sent an email, attended a meeting, leafleted, posted yr views in a web discussion, shared posts, tweeted, took photos, studied planning documents, told yr friends, dropped into our shop, or some of many other actions, THANK YOU. It all counted! If you want to talk about what this means for Peckham, do drop in to our shop on Saturdays 2-5pm or Tuesdays 2-4pm in Holdrons Arcade 135A Rye Lane. 19th September 2017: South London Press 'Multi-storey car park is an asset for town': "Citizens' association Peckham Vision has nominated Peckham Multi Storey as an Asset of Community Value. In a step to protect the building, Peckham Vision is aiming to demonstrate how the Peckham Multi Storey is a key part of the self-regenerating fabric of the town centre..."
21st September 2017: Southwark News 'Give cinema protected status': "Campaigners have applied for the PeckhamPlex cinema and multi storey car park to be given protected status, in the hope of discouraging the council's plans for redevelopment..."
Peckham Vision has nominated the Peckham Multi Storey as an Asset of Community Value (ACV) under the Localism Act 2011. This is an important step to protect this iconic building, before the Council takes decisions about its long term future. The nomination demonstrates how the Peckham Multi Storey is a key part of the self regenerating fabric of Peckham town centre. The nomination is contained in a letter, delivered to Southwark Council on 13th September 2017. The building has housed for several years a wide variety of social and cultural uses: Peckhamplex cinema, Bold Tendencies’ arts & cultural programme, Multi Story Orchestra, Franks’ Café (all soon to be joined by Peckham Levels). These have all contributed, along with Copeland Park and the Bussey Building, and the other parts of Central Rye Lane, to the emergence and growth of new creative and cultural sectors in Peckham’s local economy, and created new business opportunities for supplying these new economic sectors. The building already plays a significant role in the social, cultural and economic life of Peckham and is part of Peckham's expanding role as a destination for London as a whole and further afield. It offers a glimpse of a sustainable future for the area. It is right that the community’s interest in the building and its uses should be a central consideration in any decision about its long-term future. So the building should be registered as an Asset of Community Value as provided for by the Localism Act 2011. Peckham Vision has for over ten years been encouraging the reuse and adaptation of existing buildings, rather than their redevelopment, as a sounder approach to regeneration than comprehensive redevelopment. The burgeoning local economy in Central Rye Lane is the evidence. The Peckham Multi Storey building, once a windswept unattractive place is now showing how it also is a significant Asset of Community Value in this way. To imagine that its value can be replaced by a new development is to misunderstand the nature of the self regenerating economy in Peckham. Peckham Vision continues to call on Southwark Council to collaborate with the community to examine the long term potential of the building. Peckham Levels project is due to open in the Peckham Multi Storey empty levels in Octoberer 2017. They spent a Friday afternoon with Eileen, first at Peckham Vision’s community shop in Holdrons Arcade and finishing up at their studio in Copeland Park. They talked about her connection with and fondness towards Peckham, and asked for her overall thoughts on the project and if it's going to have a positive and lasting effect on Peckham. Eileen said "The response shows the huge unmet need for workspace accommodation. It is also satisfying that it shows the potential in reusing buildings. We hope that the Council will take part along with the community in examining the long-term potential of the building." Rest of the interview. The Council have extended the current consultation on the whole of the New Southwark Plan (NSP) to 7th July 2017. After that the next version of the NSP will come out for consultation in the Autumn. We hope the Council will have replaced the plan for comprehensive redevelopment with a plan to review the options for the site collaboratively with the community and all stakeholders before a final decision is made, as the Planning Inspector recommended in 2013/14. The Royal Academy in Piccadilly held an exhibition which featured our Peckham Multi Storey campaign tote bag. The exhibition was ‘Futures Found’ which “explores the contrasts between the ambitions for Britain’s new post-war cityscapes and the varied futures that were subsequently created.” It was an interesting small exhibition well worth visiting. There was a section on car park structures. Our Peckham Multi Storey building featured because of the alternative uses it now houses. The caption says: “Campaigns to protect Brutalist monuments have usually been run by conservationists, architects and historians focusing on architectural merits of the buildings under threat, whereas Peckham Vision is a grassroots initiative to preserve and improve the community and its assets, including the multi storey car park.” It was exciting and a pleasure to come across this as a rare recognition of the community actions that have helped to get a temporary extension of the life of the building, and the ongoing campaign to get its long term future independently and properly examined in public. We registered over 5,200 letters to the Council through the Peckham Vision wixsite webportal: https://peckhamvision.wixsite.com/peckhammultistorey, We now await the Council's response to the request for the change in the NSP's proposal that the Plan should be revised to provide for a review as the Planning Inspector recommended, before a decision for comprehensive redevelopment is taken. "A letter, drafted by Peckham Vision, to Councillor Mark Williams reads: “The multi storey building on the site has shown that it has significant ability to create jobs, small businesses and important social and community spaces. With demolition of the existing building, and redevelopment which might take several years, this embedded social value would be lost. This option would impose high environmental and social costs. This potential should not be discounted without the research that the PNAAP Planning Inspector recommended in 2013/14." Peckham Vision comment: The BIG question is whether the Council will go ahead with a risky significant disruption through demolition and redevelopment without a review of the options first. The automated letter for people to send to the Council to 'Have their say' has now been sent to the council over 4,000 times within the first 11 days since it was launched. London Live TV 11th April 2017 : "There are fears for the future of a popular independent cinema in South East London. For more than a decade PeckhamPlex has operated from a multi-storey car park. But under plans to redevelop the area, the site will be demolished. A community group called Peckham Vision say that's not what they want. Our reporter Alison Earle has been speaking to the campaigners." "Save the PeckhamPlex! Is one of London's favourite cinemas facing closure? The PeckhamPlex is an institution – and not just for the £5 cheap seats. This beloved blockbuster emporium feels like a proper, old-school cinema, with its sticky floors, extensive pick 'n' mix selection and young couples fumbling in the back row. It's a regular winner in reader-voted Time Out polls for a reason: it's part of Peckham's cultural landscape. But now the multiplex could be under threat. In 2013, plans to redevelop the area called for the Moncrieff Street multi-storey car park – the building that also houses the PeckhamPlex – to be knocked down." The ‘Preferred Options’ stage of the New Southwark Plan (NSP) was out for consultation until 7th July 2017 (extended from previous deadline of 28th April 2017). Further information here. The next consultation will be the last one and take place in November 2017. Please email info@peckhamvision.org to join the mailing list for information about the next consultation. There are 4 sites in Peckham that the NSP proposes for development. Information here. The ‘Cinema and multi storey car park’ (NSP56) is one of them. This proposal is for ‘comprehensive redevelopment’ of the (NSP56) site. This would need demolition of the multi storey building, and the end of the uses by Bold Tendencies, Franks Cafe, Peckham Levels and PeckhamPlex cinema. But it is premature (see below) to take the final decision about the long term future of the site now in the NSP. If you agree with the Inspector that further work needs to be done, you could USE THE LETTER HERE to send in your comments to the Council by 28th April. Or write your own email and send direct to mark.williams@southwark.gov.uk and planningpolicy@southwark.gov.uk quoting NSP56. The Inspector’s report recommended that the multi-storey car park site be removed from PNAAP designation for further research: see report pages 28-29, paragraphs 127 - 134. The site was removed, and the PNAAP was formally approved in 2014. The Council extended the temporary leases for Bold Tendencies and Franks Café until 2021/2022. They also listened to local proposals by Peckham Vision and Copeland Park that in the meantime the empty levels should be reused to test other potential uses. They leased the empty levels to MakeShift company for Peckham Levels which is opening in September 2017 until 2022. So there will be more useful information emerging over the next few years about the practical issues of reusing the building in the longer term, and also scope for exploring wider potential uses. It is premature to take the final decision about the future of the building before using the experience and information being generated by Peckham Levels to examine the practicalities and costs and benefits of reusing the building, and investigating its potential, as the Inspector said should be done. The Council should discuss with local stakeholders the brief for a sound examination of the potential longer term uses of the building with costs and benefits comparing comprehensive redevelopment with reuse and refurbishment. This would comply with the Inspector's recommendation and make use of the forthcoming experience of Peckham Levels, in addition to the continuing uses by Bold Tendencies and Franks Café, and PeckhamPlex. There is ample time for this work before the end of the temporary leases by 2023. The PeckhamPlex cinema has a very long lease which means they would have to be relocated or their lease CPO’d (compulsory purchased) after 2023. There is no certainty that PeckhamPlex could survive the redevelopment of this site. The review of the reuse option would be able to examine the sound ways to retain PeckhamPlex in Central Rye Lane in both the redevelopment and reuse options. Why is the building important? The building has become home for important social and cultural activities since it stopped many years ago being the Sainsbury’s food store it was originally built for in 1983. The issue at this stage is that there is no certainty that a satisfactory relocation will be possible. The strength of feeling locally for the cinema means that there should be no unnecessary risk taken with its future. This is another very strong reason for ensuring that the decision to schedule this site for comprehensive redevelopment is not taken in the NSP (New Southwark Plan) but after the public review of the building’s long term potential. The three top levels of the multi storey car park at the back have become a destination each summer for local people and visitors from all over London and further afield for Bold Tendencies' exhibitions and cultural programmes and performances. The roof-top experience, with the wide expansive spaces and view with Franks Café as a focal point, has become a significant draw for many visitors. The Multi Storey building will increase its contribution to the local community and economy because of the creation of Peckham Levels opening from September 2017 for five years providing new workspaces, and creative and leisure facilities, for local small businesses and the local public. All these uses have contributed to the emergence and growth of new creative and cultural sectors in Peckham’s local economy, and created new business opportunities for supplying these new economic sectors. The building already plays a significant role in the social, cultural and economic life of Peckham and is part of Peckham's expanding role as a destination for London as a whole and further afield. Before a final decision on the long term future of the building, it is right to review the impact of the new Peckham Levels in addition to the existing uses, and to explore the future long term potential of reusing the building compared with demolishing it and starting again. This scale model was built by Paloma Gormley, the designer builder of Franks Café. The photos show it when it was on display in 2013 in the foyer of Bold Tendencies. It is now on display with permission in Peckham Vision studio in the Bussey building. The building is a very strong and resilient structure. It would be quite likely to survive a cataclysmic event as imagined in Nick Cobb’s dystopian model. It is striking and unusual with a highly expressive structure quite unlike the repetitive and monolithic form usually found in such car parks. See the photos. The building is set back from Rye Lane fronted by Moncrieff Place which is the forecourt to the PeckhamPlex cinema. The path to the car park goes along the south side between the building and the railway viaduct. The PNAAP envisages the space between the rail viaducts, currently occupied by a scaffold yard, to be opened up to the town centre. This would include opening up the arches in the north viaduct to the town centre from Rye Lane (expected within the next few years). This would transform the path between the multi storey building and the railway, linking also to the connections with the two green paths proposals for the Peckham Coal Line and the Bussey path. The PeckhamPlex cinema occupies the front part of the building. This was built in 1983 for Sainsbury's supermarket, with the remainder of the building a multi-storey car park for the supermarket. The top three levels have been used since 2008 each summer from July to September by Bold Tendencies, a large scale sculpture park, and Frank's Café, a bar and restaurant. Each year further site-specific visual and performing arts have developed as part of the Bold Tendencies programme. The empty levels below have rarely been used, with town centre car parking using only the lower levels. Seven of the levels below Bold Tendencies are being converted by Peckham Levels for work studios, co-working spaces and for community, social and leisure uses. Council planning weblinks have all changed. It will take some time to restore all the links. If the link on this page you want is part of the PNAAP process and is broken you can find the adopted Peckham & Nunhead Area Action Plan (PNAAP) here http://www.southwark.gov.uk/downloads/download/4444/adopted_area_action_plans The Council says you can also access it from the Area Action Plans page by clicking on the relevant link, along with the supporting and background documents here: http://www.southwark.gov.uk/info/200211/area_action_plans which can be accessed from the main planning policy page on the left hand side. The Council owns the Cinema/Multi Storey Car Park and still plans to sell it for redevelopment, in spite of the huge success of Bold Tendencies, Frank’s Café and the Peckham Plex cinema showing its potential as a permanent cultural centre. However the PNAAP Planning Inspector rejected that plan, and said “… that the Council has much work to do in order to finalise a properly substantiated proposal for this site. The pending preparation of the borough-wide New Southwark Plan provides an opportunity for this to be tackled.” Since then Peckham Vision created a public discussion about the long term future of the building. This included suggestions for the interim use of the empty levels in the car park, which has led to the initiative to create Peckham Levels, opening in August 2017 for 5 years. What is still needed is a review of the alternative uses of the building for the long term and their viability to create as the Inspector said "a fully substantiated proposal for this site". The New Southwark Plan is likely to be published for consultation again in February 2017. This will include the Council's plans for the long term future of the site. These should include how they plan to carry out the work the Inspector said should be done. Meanwhile the Council has now responded to the last few year's community calls to explore alternative uses for the empty car park. The Council asked (August 2015) for bids (prospectus here) to use the empty levels as part of managing the whole building for the next 5 years - see here. This was good news and a great way to explore other uses for the short term and for the long term. Sadly, the local community was not involved in the drafting of the brief for the bids, nor the bidders encouraged to find out what the local community might want to contribute. So far local discussions have come up with a variety of potential new uses in the empty levels including cultural event spaces, workshop spaces for crafts, makers and recycling, food growing, film and location studios, retail shops, small business and community pop-ups, and temporary accommodation units linked with work units. Now the contract has been let to Pop Community Ltd (see more below), we hope that they will have a collaborative process to finding out what the wider community wants to use the empty levels for. See Peckham Vision's statement in the letter to the press after the announcement of the contract. But these new Council plans are just on a temporary basis. They say they are just for the next five years before the site is up for redevelopment. This means demolishing the cinema part of the building as well as the car park parts now showing their significant potential. So the big question now is to develop the long term vision and plan for saving the building for alternative long term uses, and convince the Council that is the right future for that site. We can do that by encouraging Pop Community to think about a variety of potential uses to meet local needs and also to test their feasibility and viability, as well as to engage with local councillors about the longer term potential. Please email your ward councillors about this so they know there is widespread support for long term adaptation/conversion, and also for protecting the views while these discussions are under way. It would be very short-sighted to save the building for the long term and lose the spectacular views. Find your ward councillors here. After representations by local people at the PNAAP Public Hearings in July 2013, the Government Planning Inspector said that he was not satisfied that the Council’s plan for redevelopment of the Peckham Multi-Storey building “has been adequately justified by the evidence base. I conclude that the PNAAP is unsound in this regard and that the Council has much work to do in order to finalise a properly substantiated proposal for this site. The pending preparation of the borough-wide New Southwark Plan provides an opportunity for this to be tackled.” The Inspector’s report recommended that the multi-storey car park site be removed from PNAAP designation for further research: see report pages 28-29, paragraphs 127 - 134. The site was removed, and the PNAAP was formally approved in 2014. There now needs to be a thorough reassessment of the ways the building could be adapted or converted for other uses, without demolition. It is now part of our local history. There is a strong case for its conservation and adaptation. 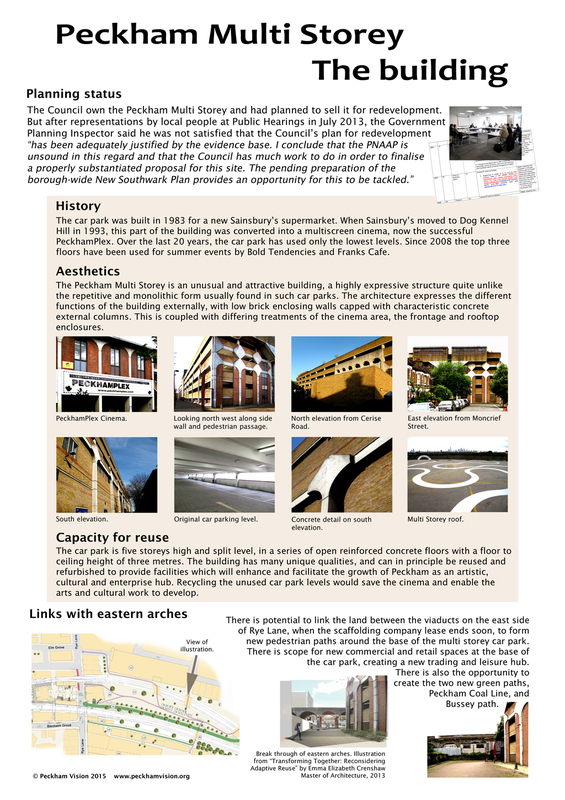 However, in the Council's draft of the New Southwark Plan, (under consultation until last March 2015), the cinema/multi storey car park site was simply listed in the schedule of development sites without any indication that the Inspector recommended further research into its capacity for adaptation or conversion for other uses. The Council has said since then that while there are no immediate plans to sell the site for redevelopment, it will be redeveloped in a few years. They have listened to local proposals that in the meantime the empty levels should be reused, and the new Peckham Levels is opening for this in Spring 2017. While this is welcome, it is not the ‘properly substantiated proposal’ for the long term use of the site that the Inspector said there should be. The Council will be consulting in early 2017 on its Preferred Options for development sites across the borough. A key issue for Peckham is what it will say about the Council's preferred option for the Peckham Multi Storey building and site, and how they are developing the substantiated proposal the Inspector said should be produced. The Council have so far said they want to sell it for redevelopment. To comply with the Inspector's recommendations, the NSP site designation must require the Council to produce a report for consultation about the future of the site, including the potential for reuse of the existing building for the long term. 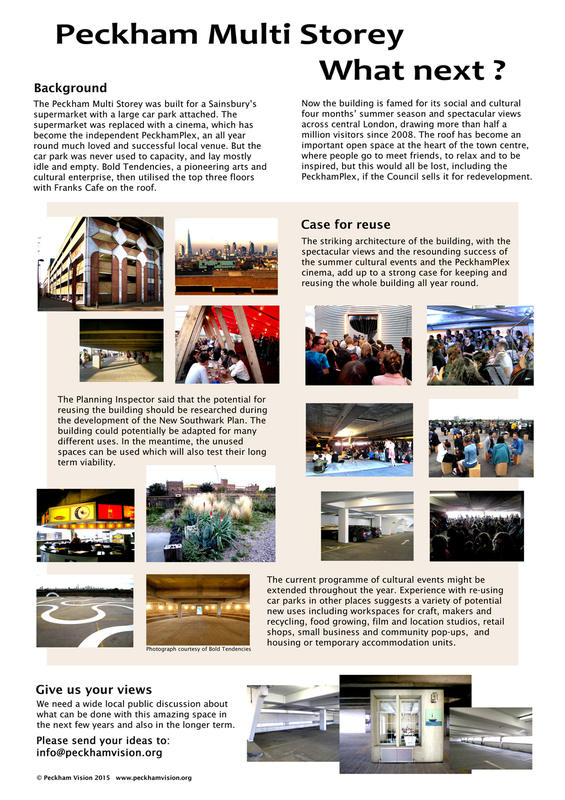 The striking architecture of the building, with the spectacular views and the resounding success of the summer cultural events, together with the successful independent cinema and the potential new uses, add up to a strong case for reusing the whole building all year round permanently. See above sections for details of the planning status, and other issues. We have been campaigning to encourage the Council and everyone to think widely and laterally about the way it could be adapted and reused in the long term. Prompted by our campaign, the Council accepted in November 2015 Pop Community's bid to run the multi storey car park part to utilise the empty levels of the building for alternative uses over the next five years, maintaining the existing alternative businesses on the top three levels. But the Council still says their plan is to sell the site for redevelopment after that. It is essential that the organisation chosen has the right proposals to enable a wide variety of workspaces to operate there in the next five years to get a good demonstration of the long term potential. The bidders were not encouraged to talk to the community and no community involvement in the process was allowed. on 6th November 2015:Pop Community Ltd, the team behind Pop Brixton, it was announced had been selected to act as interim manager of the council’s multi-storey car park in Peckham for the next five years. This is the company's statement about their plans. As we, like all other local community interests, had been allowed no voice in this process, we can only hope that they as the successful bidder will run the building over the next five years to enable the spaces to be used in the best way to demonstrate the building's potential for future long term uses. February 2016 update Peckham Levels are holding another two consultation events on their plans considering the feedback, ideas and input at the first consultations last week. They will be showing updated plans on 18th and 20th February. It’s worth going to understand what they are planning, and to give them comments. There is still time for them to consider feedback before seeking planning permission. Peckham Levels have secured planning permission for their plans for converting the empty levels for use over the next 5 years. The long term future of the building remains to be decided in the context of the New Southwark Plan. So far the Council has talked just about selling for demolition and redevelopment. The Council will be consulting in early 2017 on the designation of sites across the borough including this site. Already community action has removed the site from the PNAAP for further work to explore its potential for long term uses. The current Peckham Levels project is now showing that it is possible to repurpose the building for uses in tune with the changing Peckham economy. Now we have to give time for that to be demonstrated for the long term and not just as an interim use. Read here the background to the planning issues and the current planning process. ""Peckham Levels will spread across 6 levels of the carpark, converting the currently empty space into a mixture of environments designed to inspire and support a new community of artists, makers and creative entrepreneurs. Levels 1 and 2 will be dedicated to artists studios and a range of shared workshop spaces with print facilities, materials workshops and photography studios. Levels 3 and 4 will offer coworking space, flexible offices and shared media facilities for young creative businesses, including recording studios and editing suites. Levels 5 and 6 will become a multi-purpose community and creative hub, with event space, dedicated gallery and performance areas, retail outlets for our members to promote their work, and a food and drink offering hosting local independent traders."" Press Release about the project. The National Trust are reviewing London's views to make recommendations to the London Mayor to protect the important ones. They are asking people to tweet pictures of their favourite views to @NTlovesLondon . Share your favourite pictures of the views from the Bussey Building and #Peckham Multi Storey rooftops with your friends and encourage them to tweet theirs to @NTlovesLondon . The National Trust will be reporting the results to the London Mayor for the new London Plan. This is a way we can get the protection into the New Southwark Plan (NSP). The rooftop view from the Peckham Multi Storey and the Bussey Building is now famous. But we have just heard that the developers of the Aylsham Centre / Morrison's site are planning a 27 storey tower block. This is just in front of the Peckham Multi Storey and the Bussey Building. So the view that we and others have promoted for 10 years, and has had a dramatic positive effect on Peckham's economy, is threatened. The Council wants to encourage development of a 20 storey building in front of the view from Frank’s Café, Bold Tendencies and the Bussey Building. 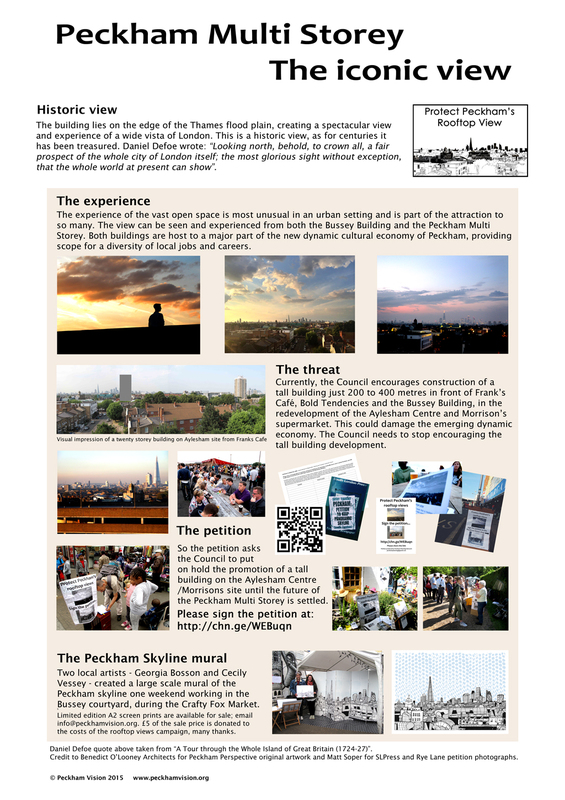 A local campaign, by the Peckham Planning Network, to protect Peckham’s rooftop views has been launched. SIGN THE PETITION HERE During the summer many thousands of people flock to Peckham town centre to enjoy the open spaces that have been created on the roofs of iconic buildings by Frank's Café, Bold Tendencies and the Bussey Building, bringing a new buzz and opportunities for economic activities to the town centre. The view over London is a major draw. But that view may be threatened if a planned 20-storey building is built on the nearby Aylesham Centre/Morrison’s site. The petition asks Southwark Council to put on hold any plans for a tall building on the Aylesham Centre site, until the future of the multi-storey car park building, where Frank's Café, Bold Tendencies and the PeckhamPlex cinema operate, has been discussed and agreed. The on-line petition can be signed here. A copy of the paper petition to collect signatures in neighbourhoods can be downloaded here. Petitions have also been available to be signed at Barry's Café beside Peckham Rye station, in Rye Lane in Khan's Bargain Store and in front of Elaine's card stall outside the cinema opposite MacDonalds. The campaign has also been present on Rye Lane outside MacDonalds and in Rye Lane in front of the Cinema with local people available to discuss the issues and with petitions to sign. The petition was presented 7th February 2015 to the Community Council, with over 4,500 signatures at that time. The Deputation explained how the view from the rooftop relates to the future of the multi storey building and research about alternative uses was explained. Deputation making its statement. There were no questions from the Councillors but one made a statement. This was in favour of discussion with the Peckham Planning Network about the future of the cinema/car park building. See here for some first pictures and comments on the meeting, deputation speaks, petition presented.The campaign is continuing while the long term future of the building is not settled. When the multi story orchestra is playing you can hear it from the platform of Peckham Rye Station. This multi-storey car park in Peckham was built in 1983 to serve Sainsbury’s supermarket. After less than 10 years, Sainsbury’s moved to its present site on Dog Kennel Hill. The cinema was built to occupy the space of the former supermarket and the car park at the back was significantly under used. In 2008, the Hannah Barry Gallery, located in the Copeland Park site which was saved from demolition by the Peckham Vision campaign, started the Bold Tendencies project, on the top three floors of the car park, as an out door sculpture park. Franks Café was developed to serve the visitors to the Sculpture Park, and a programme of events developed each year to accompany the exhibitions and Café. The first orchestral performance was in 2011. It was created by the Multi Story Orchestra. Kate Whitley and Chris the founders of the orchestra say: “2014 is the fourth year we've been in the Peckham car park. For the young professional musicians who make up the Multi-Story Orchestra it has almost stopped being a novelty! Hopefully a new generation of classical music performers, supporters, and audience members, will take on the idea, and classical music may be able to spring up in new spaces and new contexts, and continue to be a living breathing part of our contemporary culture. From the concrete expanse of level seven there are spectacular views across London, you get a powerful feeling of being detached from the rest of the world, despite being right in the middle of busy Peckham. Traditional venues for classical music are churches and concert halls. Audiences tend to dress, act, even clap, in particular ways. Classical music is often seen as something that people come to later in life, and younger audiences are in short supply. We wanted to bring classical music out of the concert hall and explore other, more exciting ways for this music to be heard and understood. By escaping the spaces that classical music normally inhabits it becomes possible to escape from its traditional associations, and potentially attract audiences who might find those associations - but not the music - alienating. The set-up is designed to create a focused listening environment, but people are free to wander. That said, there are inevitable acoustic limitations with being in a car park! During rehearsals, the space is a bit of a nightmare - an unwieldy echo creates a problematic lack of concentration of sound. The arrival of an audience essentially provides a wall around the orchestra, enclosing the sound and creating what can be a very intimate performance space. Although people are free to wander, get a drink from the bar, take a look at the view, or hang around at the back of the crowd and dip in and out of watching the performance if they like, the set-up is designed to create a focused listening environment. The audience provides a wall around the orchestra, enclosing the sound." Rumours in the town centre were circulating that the Council had sold the building to developers. Southwark News (16 June 2014) reported this was not true. Example of reusing and adapting a car park: The Remakery in Brixton. This page was last modified 13:36, 8 March 2019. This page has been accessed 422,984 times.